Come and see the plans! We are holding a public exhibition on Wednesday 25th January from 4:30-7pm at The Venue, 650 Manchester Road, Stocksbridge, S36 1DY. 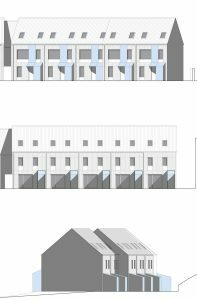 We are preparing a planning application for a terrace of 10 houses between 1 and 15 Hunshelf Park, Stocksbridge. The application will be submitted to Sheffield Council in February 2017. You will be able to view details of access improvements, noise reduction measures, landscaping and appearance and there will be members of the project team available to answer your questions. The houses will be Passivhaus certified, which is an energy-efficient building standard designed to minimise their carbon footprint. There will be information about what this means, and the benefits both to the environment and to people living in the houses. We are building for people and the environment and want to ensure these new houses work for new and existing residents alike and we would welcome your views and ideas. Please come along to have your say. If you are unable to attend our exhibition or would like further information, please get in touch on info@ourgreenhomes.co.uk.